There’s no question about it: the kitchen is the heart of the home. No matter the occasion – a party, holiday celebration, or simply breakfast on a Sunday morning – people prefer to gather in the kitchen. But if your kitchen countertops look in disrepair, your friends and family just might hightail it out of there and cut the party time in half. However, fleeing party guests isn’t the only reason you might want to consider replacing your shoddy countertops. If you’re thinking about selling your home, the seller’s market is still on an upswing, so why not take advantage of it? One way to capitalize on the sale of your home is to make upgrades that will make buyers go into an all-out bidding war. The first place to start the upgrade is with new countertops. Upgrading the condition and quality of your countertops is one of the primary ways you can add value to your home. Not only are you improving the look of your home, but if you’re thinking about putting your home on the market, you’ll reap the profits your upgrade will bring you. But before you replace your countertops, make sure you have enough reasons to do it. A minor scratch or nick might not be reason enough alone to do a complete upgrade. A few signs like the ones below might help you decide if the time is right. If any of these issues sound like your countertops, then it’s time to consider replacing your countertops. Take a look at a few of our tips and see what styles appeal to you. If you’re new to the remodeling process, all it takes is some careful planning and a little research to get the countertops of your dreams. Keep these four things to keep in mind when beginning the selection process. The first and most important thing to consider before choosing new countertop materials is your budget. If you can only spend X amount of dollars, don’t go over the limit with your choices or you will make the process a negative experience. So if you’ve really got your heart set on that more elegant quartz, you might want to save up for another year instead of go for something cheaper. While it’s tempting to go overboard with luxurious marble countertops – if the rest of your home isn’t up to par, it will look disproportional. Also, if you live in a $5 million home, it totally makes sense to do that; however, going overboard with marble in a home that is more modest won’t automatically increase the value if that’s the main focal point of the home. Just because a material is trendy, doesn’t mean the style will have longevity. Remember to keep the style of your home in mind when choosing the best material to avoid a design mismatch. Consider what your priorities are for a kitchen countertop before you commit to a material. Do you want something tough enough to withstand children, spills, and damage? Or are you willing to place a higher amount of effort into cleaning and polishing surfaces on a regular basis? When potential buyers tour your home, they notice things that they’ll need to update or repair – and the dollar signs keep adding up. If your home’s countertops aren’t up to par, it could prevent people from wanting to buy your home. You might also receive offers on your home, but at a much lower price. Instead of taking that risk, it’s better to consider putting a little money into replacing your countertops now and feel assured knowing your investment will ultimately pay off. Once you get your budget and design preferences down, it’s time to think about selecting the right materials. Quartz, stone, and a variety of luxury countertop choices are among the most popular looks to choose from. One of the best things about quartz is you get the beauty of marble without the hassle of marble upkeep. Durable and resistant to stains, quartz is a bit more expensive than other materials, but is worth it in the long run. Not only is this material low maintenance but choosing quartz will also free up your time to do other more enjoyable things besides cleaning your countertops. Quartz is one of the strongest stone materials available, which is why it’s incredibly popular too. It comes in mostly solid colors with slight variations in subtle patterns. Quartz is the ultimate choice for its beauty and durability. Granite is one of the most popular stone countertop choices out there. Because granite is not as hard a material as quartz, it can still get damaged. While sealing is required before installation, regular maintenance with a sealant every two years is certainly manageable. Regular cleaning of spills and food can avoid stains and overgrowth of bacteria from ruining a stone countertop. 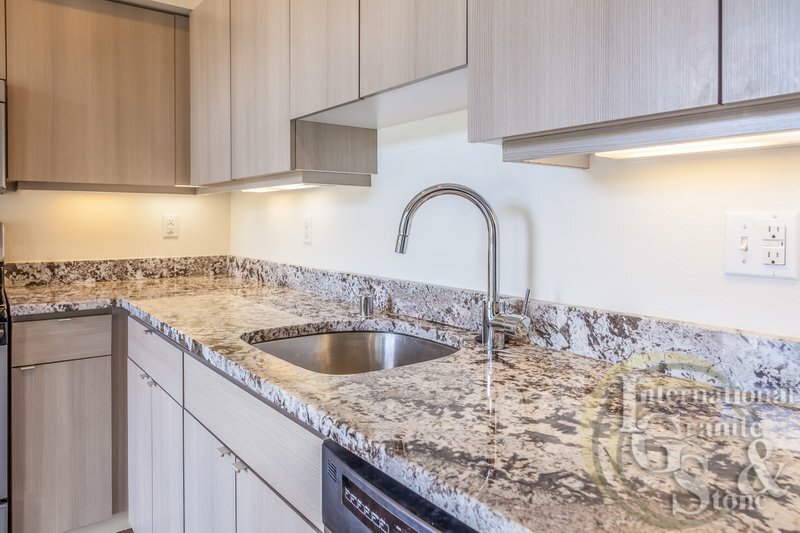 While some stone countertops can be heat and watermark resistant, others like marble need a top of the line sealant to maintain their durability. Stone countertops are considered high-quality for their luxurious look without breaking the bank. Choosing a luxury material for your countertops is a great idea if your budget allows for it. Not only will you have more unique choices, but potential home buyers will feel like they won the remodeling lottery with your exquisite taste. Luxurious countertops tell a stylish story all their own. Depending on the color, texture, and patina, a luxury countertop can also serve as a focal point of the home. While these are just a few examples of luxury materials, the sky is truly the limit when it comes to choosing a high-quality material for your new countertops. Whether you’re planning on selling your home soon or just want a fresh look, choosing new countertops should be a fun and hassle-free experience. When you’re ready to talk about an upgrade, contact us today and we’ll help you find the countertop of your dreams.